I’m a Costco skeptic. When people rave about the bargains, all I can think about is the horror of finding a parking space. And then there’s the phenomena of entering with four items on the shopping list and leaving with an overflowing basket and a few more digits than desired on the sales receipt. Costco came through in a pinch yesterday. I stopped by for coffee and ink. Left with chicken thighs, bananas, a beach towel and some other things I didn’t expect. 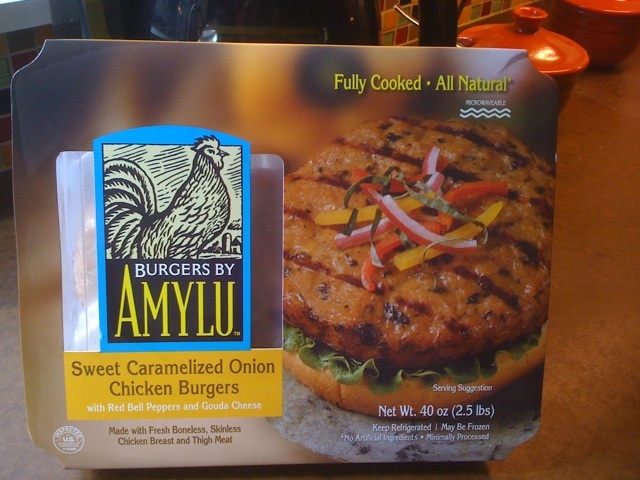 Including AmyLu’s Chicken Burgers with Caramelized Onions and Gouda. Chicken burgers on Orowheat Sandwich Thins, topped with Trader Joe’s red pepper spread; a side of mini farfalle pasta with Cibo Naturals pesto sauce; and arugula salad with pears, pecans and goat cheese. Yum!